Queen Anne’s Pocket Melon, also known as Plum-Granny, is an unusual annual trailing plant with highly aromatic, ornamental fruit that has been grown for at least 1000 years. 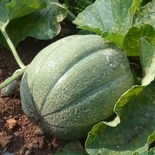 Although possibly named for Queen Anne of England (1702-14), this melon is native to Persia and Linnaeus attributed it to Egypt and Arabia. Legend has it that the ladies of the Queen’s court carried the fragrant melon as a perfumed sachet. 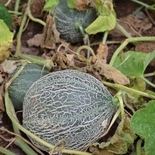 While edible, this melon is valued more for its scent than its rather flavorless white flesh. It ripens to orange with lemon-yellow stripes. Direct sow seeds 1-2 weeks after the last spring frost in hills; sow 6-8 seeds in 12”-wide hills, then thin to 3-4 plants per hill. 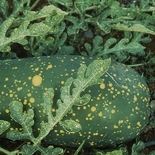 Plants prefer well-drained, sandy soil. Approximately 12 seeds per packet.